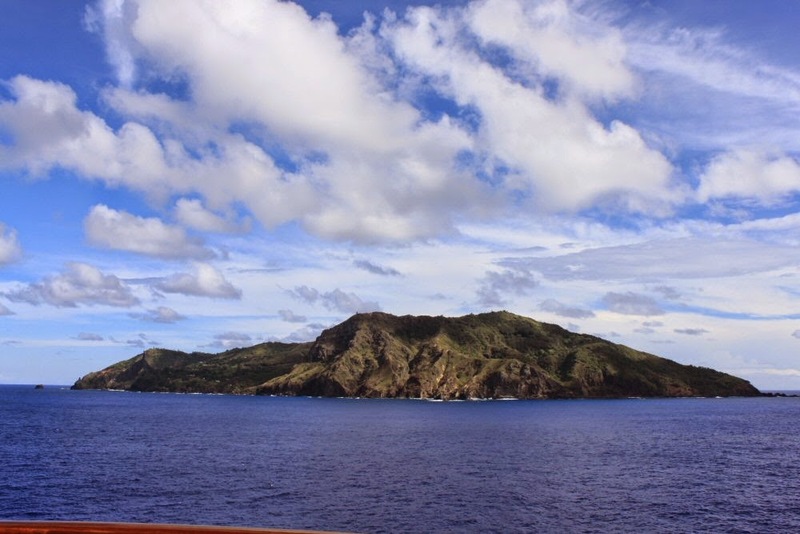 Several more sea days between Easter Island and Pitcairn. Life on board ship for us is almost getting routine. As a matter of fact when we showed up in the dining room for breakfast fifteen minutes later than usual, a waiter grinned at us, looked at his watch and said, “You’re late.” After more than three weeks aboard ship, the crew and world cruise passengers are truly getting to know each other well. The build-up in anticipation of our visit to Pitcairn Island included a day of Pirates at Sea. 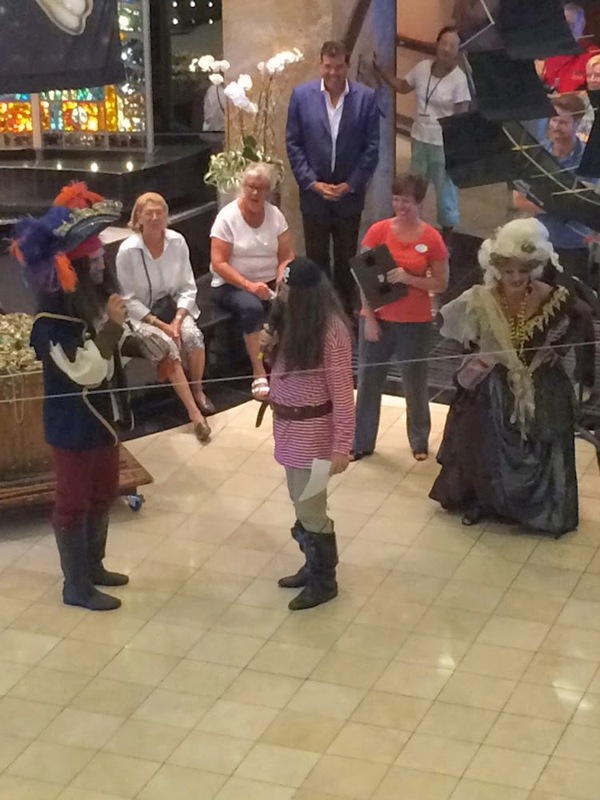 The entertainment staff put together quite a day and evening of pirate themed fun. 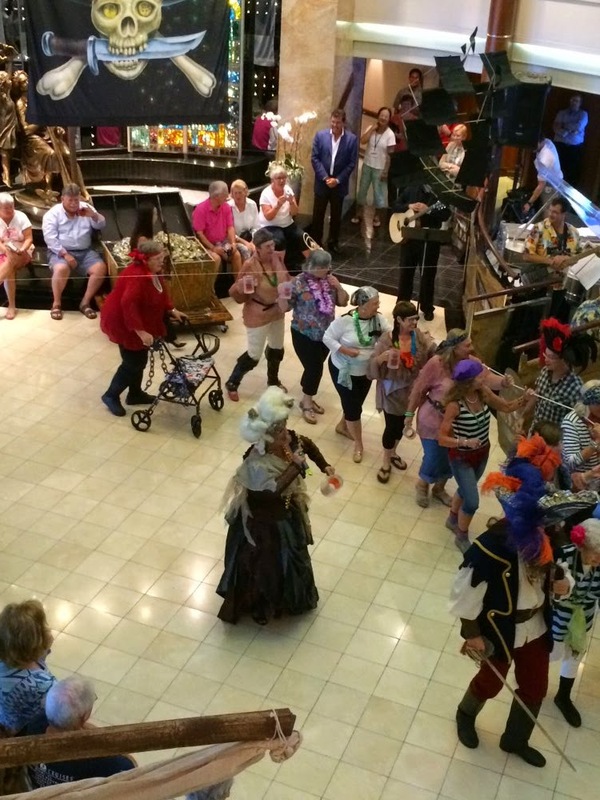 The atrium was decorated with a ship and a midday program included the cruise choir (passengers) dressed in pirate gear and singing an appropriate Yo-Ho song. Of course our days at sea also included talks of the Bounty, the mutiny, Captain Bligh and Fletcher Christian and naturally the movie. We’d seen the movie before while sailing in the area on a Princess ship—out on deck getting sprayed with salty sea water on a rough night. We passed this time even though it was indoors. The amazing thing is that no matter how many times you hear the story, it never seems to be the same. We were hoping that once we got to Pitcairn the residents would set us straight. The Bounty was originally sent to the South Pacific to Tahiti to gather breadfruit to bring back to the Caribbean where it could be used to feed the slaves cheaply. (Later we found out that when it finally made it on another voyage, the slaves refused to eat it.) Since they had to wait for the breadfruit to be ready to harvest, the crew stayed for quite a while on the island and ended up falling in love with it and some of its female inhabitants. Fletcher Christian had apparently married one of the island girls. Needless to say, they were disgruntled when they had to leave and it seems that while Captain Bligh was a great sailor, navigator and chart maker, he wasn’t so good at human resources and management. Thus a mutiny occurred and Captain Bligh and as many men as could fit in a long boat were put out to sea with meager provisions. He and the men in the boat survived a 3600 mile trip to another set of islands where they caught a ride home. Meanwhile, Fletcher Christian and seven other men who had mutinied gathered twelve Tahitian women and six Tahitian men and set out to find a place to settle where they wouldn’t be found by the British. 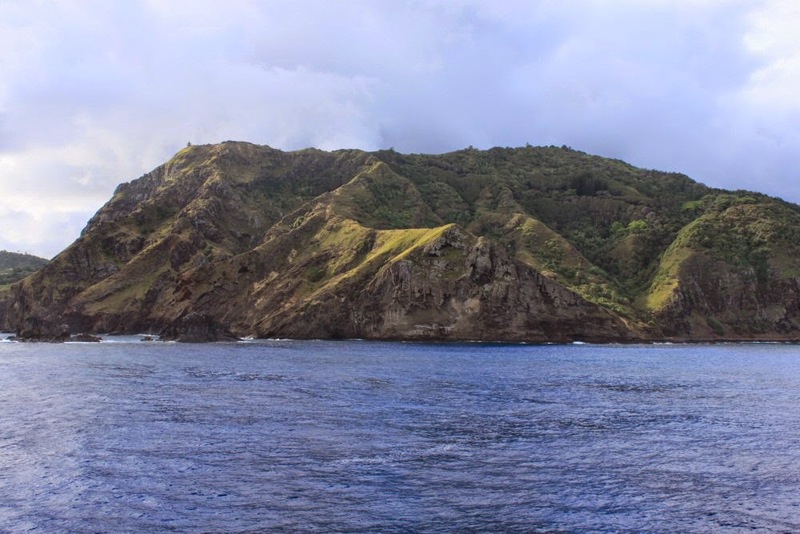 Pitcairn happened to be incorrectly marked on navigational maps and when they happened upon it in January of 1790, they thought it would be the perfect place. They took everything they could from the ship that they could reuse and then set the rest on fire so that the ship anchored off shore would not be evidence of their hiding place. There was some fighting, some disease, and other stories, I’m sure, of how the original mutineers died but eventually the only one left was John Adams. He had been taught to read by one of the other mutineers, Young, I think. The only reading material was the Bible and a prayer book. By 1800, Adams was the only mutineer left and he became the founding father of the town. He is said to have led with kindness, fairness, and good sense. The island was converted from the Church of England which had been the religion of the mutineers, specifically Young and Adams who instilled faith and the following of the church’s traditions to the Seventh Day Adventists after a box of their literature was sent to the island followed by a missionary who convinced the then islanders of his faith. Tomorrow I’ll tell you more of our visit.